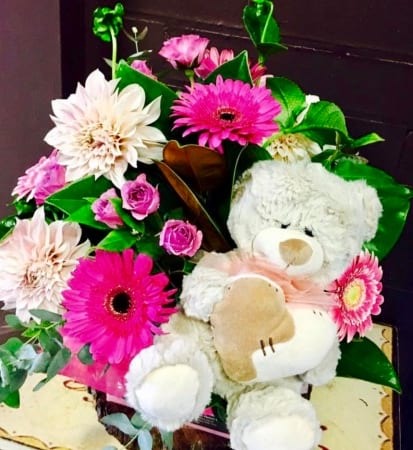 This gorgeous vibrant arrangement is perfect for the new mum, with an adorable teddy bear for the new baby. Bright gerberas, carnations and fresh flowers. An adorable arrangement perfect for a new baby, or a young girl`s birthday. Amaranthine Flowers By Design is a local florist in New Lambton offering same day delivery six days a week to all areas of Newcastle and the Hunter Valley including John Hunter Hospital, Charlestown Square, Newcastle Private Hospital, Lake Macquarie Private Hospital and Mater Hospital. Include a message on our complimentary gift card or enhance your flowers with one of our fantastic add-on gifts, your selection of chocolate, wine, bears, balloons, candles and many more.